GREENSBORO – A little over two years ago, a 22-year-old Greensboro mother and her 2-year-old son were found dead in the trunk of a vehicle that had been set on fire. Today, the case remains unsolved. That’s where you come in. From the comfort and anonymity of your personal computer or cellphone, you could be the key to bringing the person responsible for the deaths of Asia LaRose Brown and her son, Ashton, to justice. 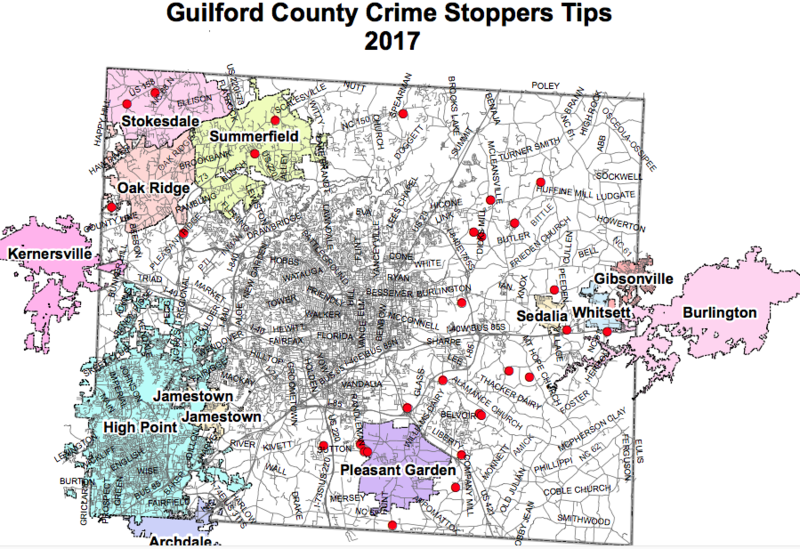 The red dots on this map show locations tips came in during all of 2017 from across Guilford County. And you could get paid for your help. Stacey Finch is a Greensboro Police Department employee and coordinator of the Greensboro/Guilford County Crime Stoppers, a nonprofit organization that guarantees anonymity for those who convey tips that lead to the arrest of criminals – and pays them for their assistance. She presented an overview of the program during the Sheriff’s Citizens Academy, a community education outreach program coordinated by the Guilford County Sheriff’s Office. During a dozen Thursday evenings and Saturday mornings in February and March, over approximately 40 hours, more than a dozen participants were shuttled, herded and corralled as they heard from guest instructors on a wide variety of topics: from CCH permits to crime scene processing, and from animal control to jail operations. Quite frankly, a lot could have happened. The heads of both the Greensboro Police Department and the Guilford County Sheriff’s Office can claim their efforts, including the support of Crime Stoppers, has had a direct result in lower crime rates, including violent crime. What a program it has been. Between 2012 and 2017, the board of directors has approved an average of $23,528 in payouts each year, including a high of $40,050 in 2012. Rewards for tips range from $100 up to $2,000. Finch said the amount depends on a number of factors, including the severity of the charges, the number of people arrested, the value of the property or drugs recovered, and whether or not the tipster put themselves in danger by reporting the information, among others. Since the program began in 1981, nearly 35,000 tips have been submitted. Those tips have led to 16,960 charges, 8,453 cases being cleared, more than $8.9 million in recovered property and more than $15 million in seized drugs and cash. 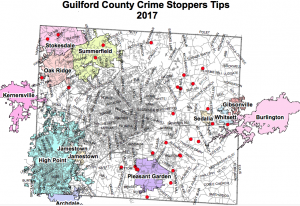 In 2017 alone, the tip line – by calling 336-373-1000, going online to ggcrimestop.org or sending a text to 274637, and including the keyword “badboyz” at the start of your message – garnered 1,281 tips that led to 354 charges being filed and 200 cases being cleared. Property, cash and drugs recovered from those tips totaled more than $685,000. Finch reviewed the concept of anonymity. When a tipster submits information, that person is given a code. The individual can then call back to check on the status of the case and if a reward has been approved, the caller will be given a second code and instructions on how to pick up the cash from a local bank – no identification required. 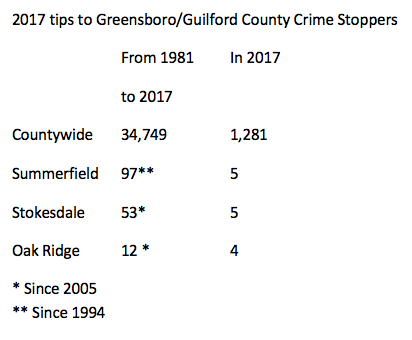 This table shows tips submitted from Northwest Guilford County municipalities since the Crime Stoppers program came to the county in 1981. The second column shows 2017 tip submission figures. The payouts, meanwhile, do not come from taxpayer money, Finch said. Instead, the program relies on corporate sponsors, fundraisers and from donations from family members who have been victims of crime or individuals who see the value of a safer society. Finch also highlighted the success of a new effort called Gun Stoppers. The goal of the program is to remove illegal guns from communities. The process of submitting a tip remains the same, but if law enforcement confiscates an illegal gun, the minimum payout is $250. Gun Stoppers was initiated in February 2017. In the year since, 78 tips have led to 48 firearms being recovered, 33 solved cases, 33 arrests – including nine felons who were in possession of firearms – and 119 felony charges. In addition, the tips have led to $120,469 in seized cash, $192,138 in seized drugs and $61,119 worth of recovered stolen property.